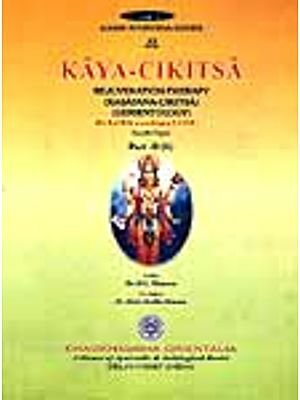 'Manasa Prakriti' a unique concept of Ayurveda plays a pivotal role in understanding the individual. Measures to maintain health and methods to manage diseases should be advised after the evaluation of ' Man as a Prakriti'. More emphasis is given for 'shareerika prakriti' in day to day practice, but the subtle and important 'Manasa Prakriti' is concealed till today. In the present work Concept of Man as with all its perspectives and Concept of Prakriti in general are narrated. Differences between shareerika, manasa and bhoutika prakritis are emphasized. Factors responsible for the formation of 'Manasa Prakriti', factors influencing 'Manasa Prakriti', different components of'Manasa Prakriti' are narrated in detail. 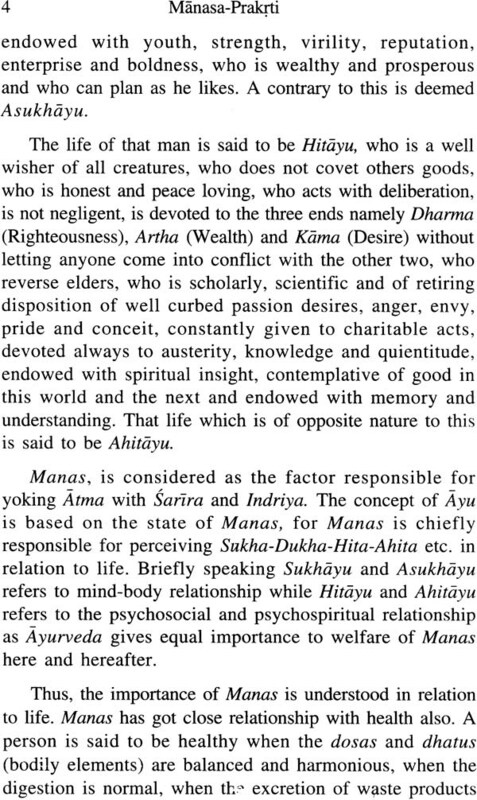 Role of prakriti in three skandas i.e. Hetu skanda, Linga skanda and Aushada skanda are narrated. 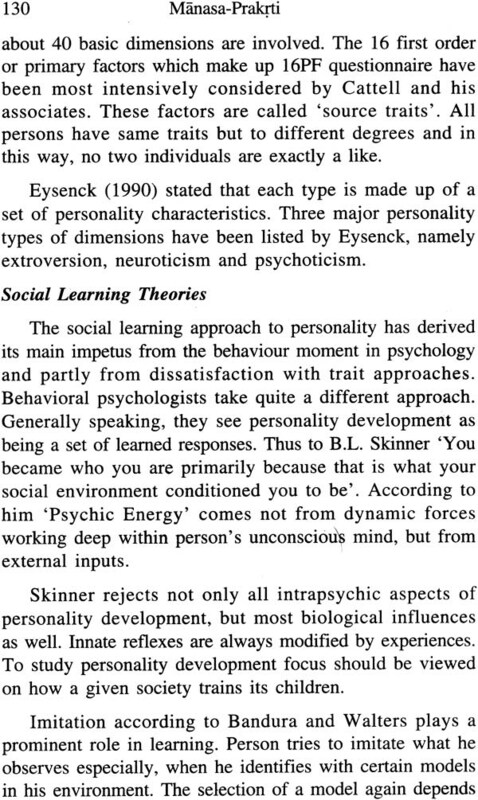 'Concept of Personality' which is narrated in the contemporary science simulates with the concept of ' Man as a Prakriti'. 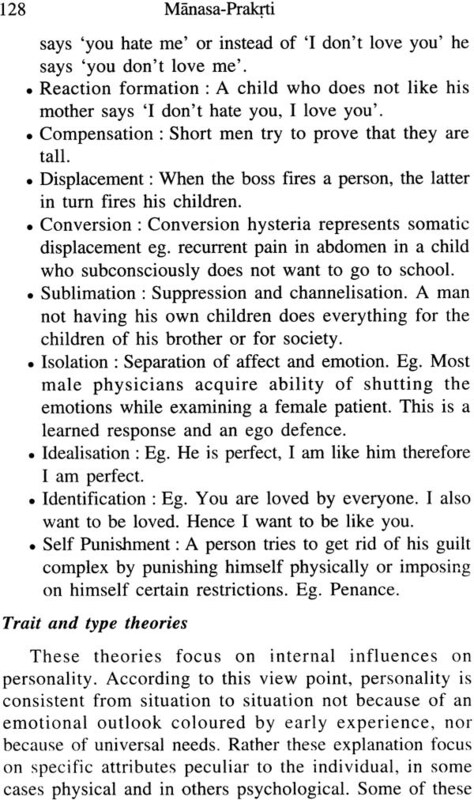 Here a humble effort has been made to explain the concept of personality in brief and to explore the unique concept of ' Man as a Prakriti' with the support of all relevant references. Hope the scholarly personalities of Ayurveda will accept it. Dr. Shreevathsa, basically from Shirnoga district, Karnataka state, is working in the department of Ayurveda Siddhanta-P.G Studies, Govt. Ayurvedic Medical College, Mysore. He completed his BAMS from Govt. Ayurvedic Medical College, Mysore in 1996 with I" rank. He completed his M.D. (Ayu.) from LP.G.T. & R.A., Gujarat Ayurved University, Jamnagar in 2000. He is double Gold Medalist and 'Rotary Pandit Ayurvedic Educational Awardees'. He completed P.G. diploma in Yoga and Vidwat (P) level in Karnatic music. He is practicing Yoga Chikitsa, Naada Chikitsa and Ayurveda Chikitsa. He participated in various National and International seminars as resource person. He published a book on Yoga named 'Yoga Sadhana'. Dr. Rambabu Dwivedi completed his BAMS (Ayurvedacharya) in 1st class from Kanpur University in 1976. He did his M.D. (Ayu.) in Kayachikitsa from Gujarat Ayurved University, Jamnagar in 1980 and Ph.D. from the same institution in 1993 in the speciality Basic Principles. At present he is the Professor and Head, Dept. of Basic Principles, Gujarat Ayurved University, Jamnagar. He also served as Ex-Director, LP.G.T. & R.A., Ex-Dean; LP.G.T. & R.A. He is the Member of CCIM (Dept. of AYUSH, Ministry of Health & F. w., Govt. of India.). He has over 30 years of P.G. teaching experience and has guided above 100 P.G. scholars and 16 Ph.D. scholars till now. He has more than 80 publications which include IS peer reviewed and indexed journals, 2 National and 5 International journals. His areas of special interest include Basic Principles, Research, Clinics, History and Philosophy of Medicine. Ayurveda, so called an eternal science, the science of life deals with spiritual, psychological and physical wellbeing of the individual. It covers all the spheres of human life. It is not merely a materialistic science, but a philosophical and factful truth, which our great ancestral sages, through their experience, logic and power of wisdom enhanced by yogic practices had found true and proved it to the truth of time. To keep it in pace with the advancing so called scientific age or modem age is the present day task. To proceed with such an incredibly rewarding task is not mere a challenge but an exhaustive endeavor. 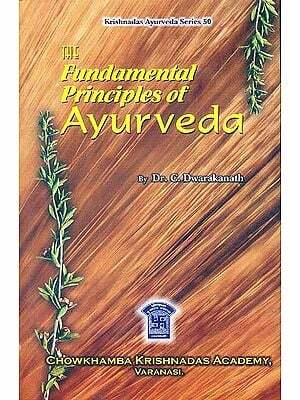 Before undertaking this venture, it is necessary to go into the fundamentals of the system of living i.e., Ayurveda which is the 'Science of Man', which deals with the ultimate- intricacies involved right from his birth to death or rather even to the life beyond death. 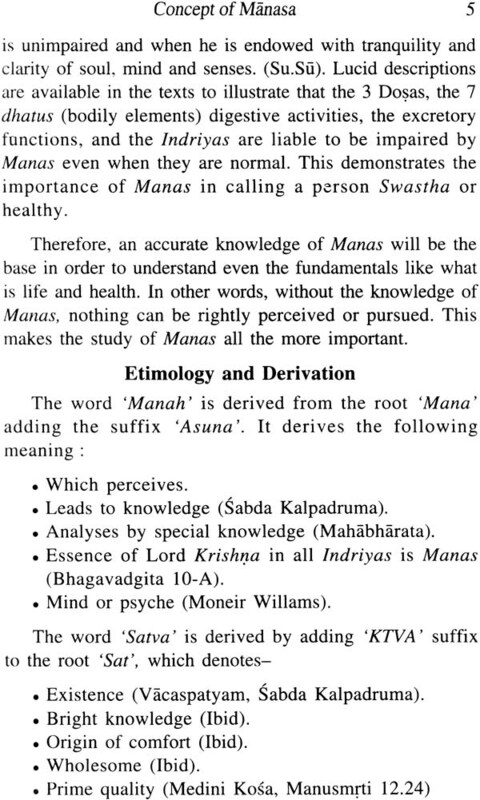 If the origin of the word 'Man' or 'Manusya' is traced, it comes from the root 'Mana Inane' and the etimological interpretation can be 'Mananat Manusyaha', It is due to this incredible function of Manana or Analysing capacity that man has shown as a living creature, so dominant, so superior that he virtually rules the Bhuta Loka. The very definition of Manusya would have been at stake if not for his subtle, highly developed mind or Mana which has made all the events possible. 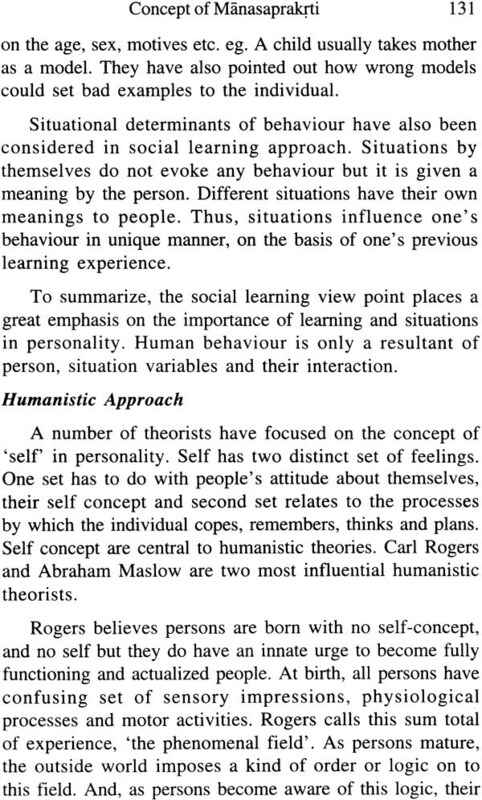 The make up of the mind, what we refer to as 'Manasa Prakrti' is co-originated with 'Sarara Prakrti' during Sukra-Sonita Samyoga i.e., to say the individualistic attitudes, behaviour, response, intellect, reasoning and other instinctual characteristics are all pre determined. So, is the susceptibility and vulnerability to psychological stressors and the out coming diseases, as has also been said by H.M.C. Laurin Eastern in his famous book - 'Philosophy of Western Mind' - The mental state has a definite effect on several nerve centres placing them under varying degrees of tension or relaxing them in varying degrees as the case may be. The state of tension or relaxation in various nerve centres determine the manner in which the respective organs under their control are going to function. The way in which the organs function affect the structure and that in turn will affect the material make up of the body as a whole. Some group of thoughts are conducive to disease and some others to Health. The same has been highlighted by Acarya Caraka 'Sariram Hyapi Satvamanuvidhiyate Satvam Ca Sariram'. 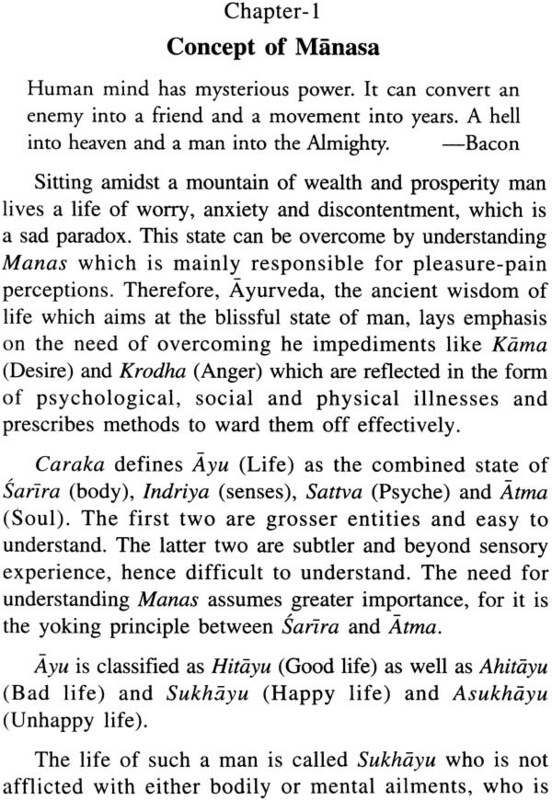 This further emphasizes the study of Prakrti in relation to biological functioning as well as its pathological aspects and justifies a role unsecondary to Manasa Prakrti with that of Sarira Prakrti. Since ancient times, attempts have been made to classify the human beings into distinct types in terms of constitutional factors for predicting general personality and to study the inter relationship between Sarira and Manasa Prakrti. The study of Prakrti and its association with disease, can be traced as early as from vedic period. But a comprehensive and systemic account is available from the time of Sankhya. 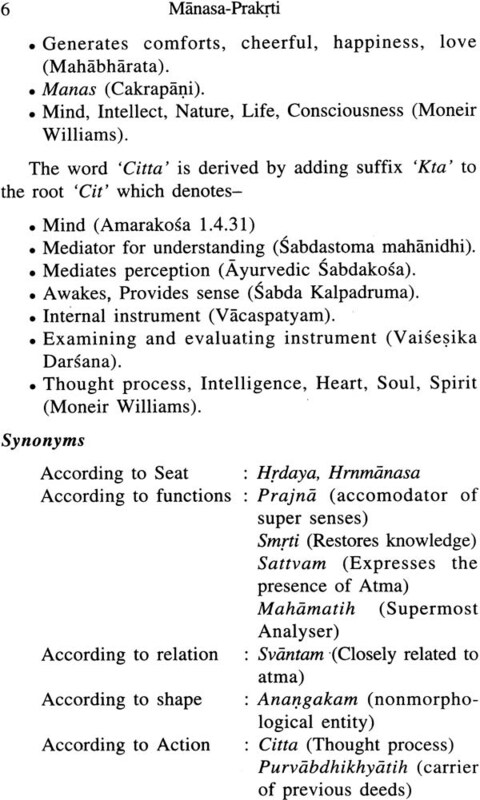 Caraka and Susruta both have given elaborative description of Prakrti. According to them Prakrti is the sum total of functional and behavioural aspect of man. 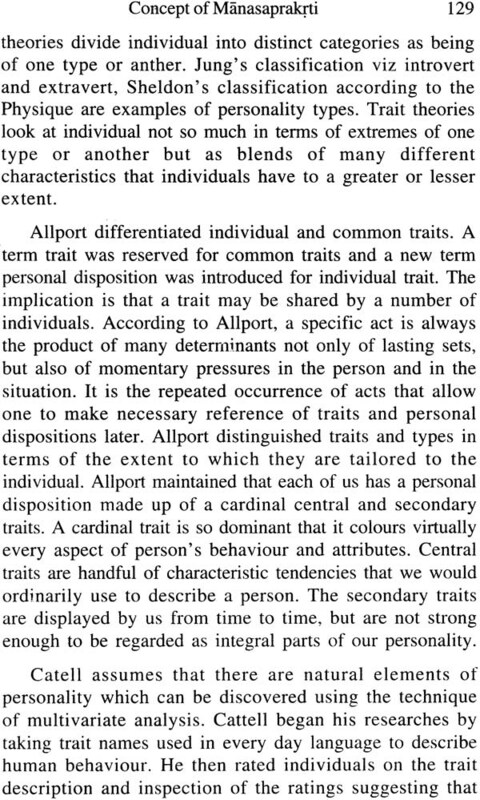 This may be divided into different types and in different ways. Garbha Sarira Prakrti or Dosa Prakrti and lata Sarira Prakrti correspond to Jati, Kula, Vayu, Desa, Kala and Pratyatma niyata etc and the same is applicable to Manasa Prakrti also. The natural predominance of one or the other of these Saririka or Manasika Dosas present the natural characteristics of the individual human constitution. In Ayurveda the concept of health, prevention and treatment of diseases are based on these three major types of physical and mental constitution. Here an honest effort has been made to throw light on the 'Concept of Manasa Prakrti At this juncture, we would like to acknowledge all our teachers, students, patients, well wishers and family members. We are also thankful to Sunil ji and Ashok ji of Chaukhambha Visvabharati, Varanasi for publishing this work. I am the original artist of the art work you have used as the cover for this book and I did not give permission for it to be used here. You are in violation of USA copyright laws and the Burn Convention. Please remove my artwork from your site and book covers immediately or face legal action.